Sorry, Lao National Museum is permanently closed. Laos is known for its UNESCO-landmarked temples in Luang Prabang and the lush jungles located just across the Mekong from Thailand. Few realize it’s also the most heavily bombed country per capita in the world. 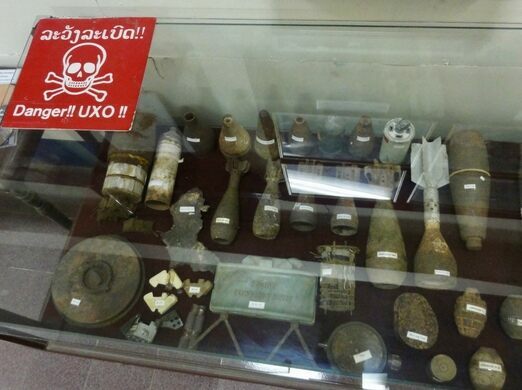 Between 1964 and 1973, the United States army dropped 2 million tons of cluster bombs over Laos in a covert attempt by the CIA to wrest power from the Pathet Lao party aligned with the Viet Cong. That’s the equivalent a planeload of bombs dropped every 8 minutes, around the clock for nine years. The Pathet Lao won anyway, and this museum is dedicated to telling the story of that improbable victory. Visitors to the Lao National Museum, housed in the former French governor’s mansion, are quickly hurtled through the early history of Laos via a small exhibit of dinosaur bones and a St. Patrick’s Day green diorama of the Plain of Jars to arrive at the museum’s true focus: the Lao Revolution of the 1970s. 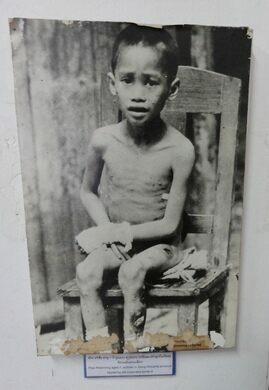 You’ll see photos of entire classrooms of children being taught in underground caves to avoid the bombs, though there are photos of broken children and broken buddhas, too. Many Americans are familiar with photos of college students in the 1970s protesting the draft. 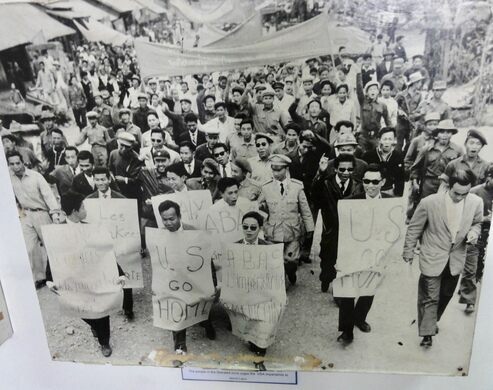 Here, you’ll see arresting images of Lao holding “U.S., go home” signs and burning effigies of Henry Kissinger; not the type of thing you find in most American history books. 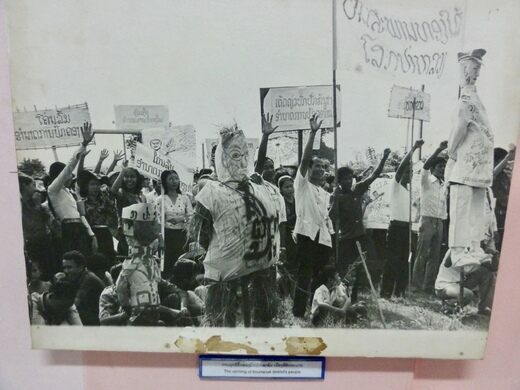 Central to the museum’s narrative is the larger-than-life Comrade Kaysone Phomvihane, the revolutionary leader of the Pathet Lao and first prime minister of the Lao People’s Democratic Republic. 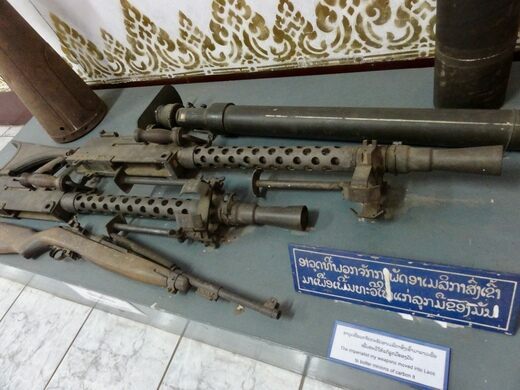 You’ll find “the gun used by Comrade Kaysone Phomvihane to protect himself during the fighting against the U.S. imperialists,” enclosed alongside “the briefcase for comrade Kaysone Phomvihane’s documents during the fighting against U.S. imperialists,” his tea kettle (you get the picture), and even a sort of bicep curl contraption used by the Comrade himself. Update March 2019: The museum is no longer open. The nice rustic colonial building is still there and you can take photos outside of the territory. A new museum is under construction. 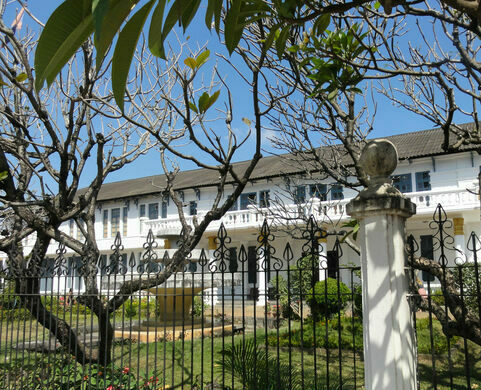 Note that the museum was formerly called the Lao Revolutionary Museum. Down the road from the museum is the visitor center for COPE, an organization that helps bomb victims with their recovery. 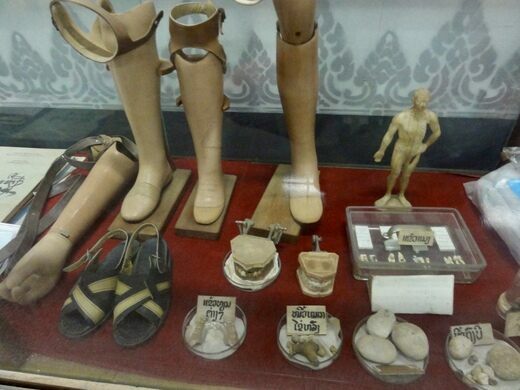 It displays prosthetics as well as other artifacts and photographs telling the story of the war.